Glenshieling Lodge in Rattray, near Blairgowrie, Perthshire sleeps 4 people. Glenshieling Lodge near Blairgowrie is a beautifully presented gate lodge which sits in the extensive grounds of Glenshieling House in a quiet part of Blairgowrie. The owners have taken care to preserve some of the traditional fittings, including continuous curved handrails and round windows with deep sills, while ensuring a high level of comfort. Furnished with quality fittings throughout, guests will feel truly pampered and taken care of. There is a south-facing garden to the rear with a raised decking area with table and chairs; suitable for al fresco dining on those lovely warm summer days, where you can enjoy a barbecue or a glass of something in peaceful surroundings. The road is very quiet and the only sound you may hear is the moo of the highland cattle which are often in the field opposite! It is only a 15-minute walk into the centre of Blairgowrie where there are good restaurants, pubs and shops. Perfect for walkers, cyclists, or for those keen on fishing or golfing these activities are readily available nearby. During the winter season when weather conditions permit, a short drive will take you to Glenshee Ski Centre, going through some fantastic scenery. If you are looking for that exclusive get away for a family gathering, special birthday or a group of friends just looking to escape from the everyday hustle and bustle then Glenshieling Lodge is your ideal location. The shop is 500 yards from Glenshieling Lodge near Blairgowrie, with the pub and restaurant 1 mile from Glenshieling Lodge. Living area: With wood burner and Smart Sky TV (movies package). Kitchen area: With double electric oven, gas hob, microwave, fridge/freezer, dishwasher and washer/dryer. Bedroom 1: With zip and link twin beds (can be super king-size on request) and Freeview Smart TV. Bedroom 2: With king-size bed and Freeview Smart TV. Gas central heating, gas, electricity, bed linen, towels and Wi-Fi included. Travel cot and highchair available on request. Welcome pack. Large lawned garden with decked sitting-out area and garden furniture. 1 small dog welcome, to be kept on lead at all times. Bike store. Private parking for 2 cars. No smoking. Please note: There are hens in the grounds. Holidays at Glenshieling Lodge run from Saturday to Saturday. Pets allowed at Glenshieling Lodge. For a better idea of where Glenshieling Lodge is, you can see Glenshieling Lodge on the map below. Glenshieling Lodge is in Perthshire; should you be on the lookout for a special offer, you can find all the special offers in Perthshire. It's always worth checking to see what is on offer at the moment. 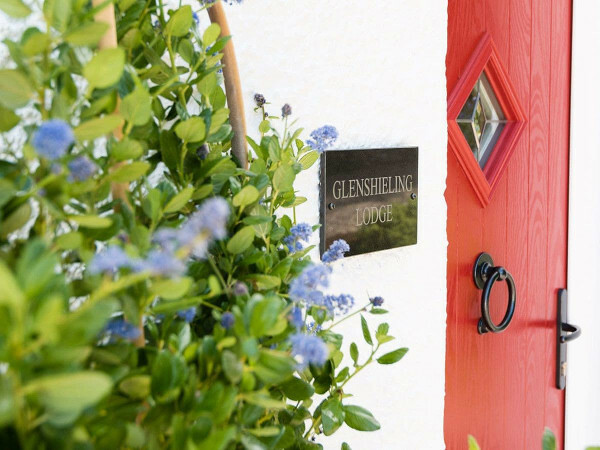 Do you want to holiday near Glenshieling Lodge (UK11150), you can see other cottages within 25 miles of Glenshieling Lodge; have a look to find your perfect holiday location.